More than 40 bicycle riders and a dozen walkers made the inaugural climb up the Big Dam Bridge's southwest approach Wednesday morning. On a cloudy and steamy morning, the central Arkansas crowd gathered at the foot of the pedestrian bridge's new ramp to celebrate its grand opening. "A lot of people take the Big Dam Bridge for granted, that it's just another structure. But it's not. It's an engineering feat," said Colonel Glen A. Masset, U.S. Army Corps of Engineers-Little Rock District Commander. "I can tell you that the Big Dam Bridge is an icon of the City of Little Rock and of Pulaski County." The southwest approach to the Big Dam Bridge over the Arkansas River is the second phase of a pedestrian and bicycle bridge that began in 2002. The bridge, completed in 2006, is constructed above the Murray Lock and Dam, and the Society of American Travel Writers has named it one of the top 10 bridges to visit in the United States. Garver provided engineering services for the bridge and its newest access ramp. "When we did the original design for the Big Dam Bridge, part of that had a southwest ramp," said Pulaski County Judge Buddy Villines. "We didn't have the money to go forward then with that part, but we asked the Corps and the designers to leave a stub so that we could in the future add it." "Well, we've saved money for about six or seven years so we could add this," Villines continued. "It's totally funded by local dollars, about $4.2 million to construct it." The southwest approach provides bicyclists a route to connect with the Two Rivers Bridge without attempting a tight 180-degree turn, and pedestrians now have a great view of the lock and dam from an upstream vantage point. 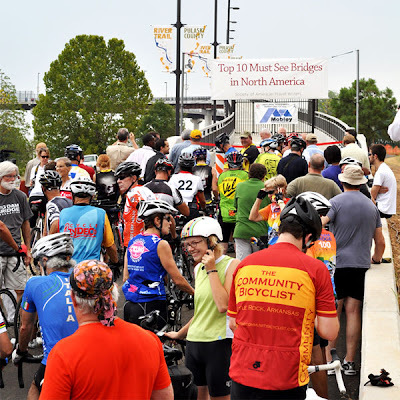 The bridge is part of the Arkansas River Trail, which attracted attention in June when area leaders signed a memorandum to continue to build, develop, maintain, operate, and promote the trail system. The project involved nearly 1,300 cubic yards of concrete and brings the bridge's total length to approximately 5,270 feet. The new leg features a 325-foot curved steel plate girder unit, MSE approach ramp, cofferdam construction, and elevated observation platform. 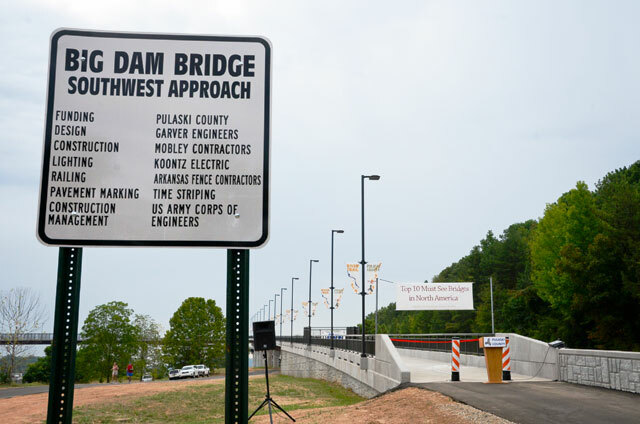 Villines said that the Big Dam Bridge has become a focus for healthy activities in central Arkansas, which is a vision Susan Cooper with the Big Dam Bridge Foundation hopes to expand. Cooper announced that the foundation hopes to increase the number and types of events that revolve around the Big Dam Bridge, everything from sponsored walks to concerts to triathlons. "We now have plans in place for new and exciting goals," Cooper said. "Last year, our bicycle tour [Big Dam Bridge 100] grew to around 2,400 riders. We now plan to make it as big as the Hotter than Hell 100 in Texas, which draws 14,000 riders." If you weren't able to attend the event, Garver Tweeted during the ribbon cutting and has posted additional pictures on our Facebook page.